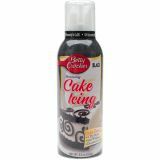 Betty Crocker Decorating Cake Icing Can 6.4oz - Decorate your cakes in minutes! Easy flow decorating icing is designed to make your decorating fun and easy. Soft whipped frosting for creating classic cakes.Comes with drawing tip, ribbon tip, leaf tip and star tip. Contains one 6.4oz can of frosting. Made in USA.